The greatest disruption was probably social, however. Life before the earthquake was punctuated by endless get-togethers, dances, and card parties hosted by the fraternal lodges and ladies’ social clubs, and almost all of these gatherings were on hold since the disaster. The Athenaeum theatre and the Novelty vaudeville hall were both gone, so there was little to do at night, either. So after you’ve told your how-I-survived-the- disaster story to everyone you knew and tsk’d over their disaster stories, there was precious little to do in Santa Rosa. Maybe that’s why the town went crazy as a betsy bug over roller skating that summer. It was immediately a terrific success. Santa Rosans packed the place; even if you didn’t skate, there was enough seating for a thousand to watch. Within days, the Santa Rosa Republican began running a “Skating Rink News” section on the front page to keep everyone up-to-date on the latest doings at the Pavilion, and the Press Democrat followed with its own front page column soon after. Here was news you really needed to know; that evening there might be a match between Santa Rosa’s “polo team” (roller skate hockey) and competitors from Healdsburg or Petaluma, or there could be a grand march where all comers would be given a red, white, or blue Japanese lantern to carry, or there might be an hour reserved for couples near closing. Professionals also came through regularly with “fancy skating” exhibitions. Every day there was something new to see, and you or someone you knew probably saw it. But skating was just part of the fun. Two months later, Bowers and his partner opened Santa Rosa’s first swimming pool next door. At 40 x 100 feet it wasn’t modern Olympic size, but then again, competition pools usually don’t have a slide, trapeze swing, rings, or an attached skating rink. This likewise was a great success, and come November, they closed the swimming baths for the winter and placed a dance floor over the pool. Now it became “Bowers’ Hall,” Santa Rosa’s ballroom. Together, the Pavilion and Bowers’ Hall became the town center that Santa Rosa never before had. The buildings even functioned as a convention hall for large gatherings, somewhat like the grand auditorium that architect William Willcox had recently hoped to build. in January 1907, more than 3,000 packed into the skating rink on a Saturday afternoon to hear William Jennings Bryan pontificate about America’s greatness and its destiny to lead the world. And as the annus horribilis of 1906 came to an end, two dances at Bowers’ Hall helped close the year on a pleasant note. The week before Christmas there was a dignified “Grand Masque Ball,” and then on New Year’s Eve, a decidedly UNdignified “Sheet and Pillowcase Masquerade.” There dancers wrapped their bodies in a bedsheet and covered their head with a pillowcase with two holes cut for the eyes. “The amusing feature is that often it is hard to tell whether your partner is a gentleman or a lady, and times have been when men have had men for their partners, much to the amusement of all,” promised a blurb in the Republican. It’s another of those moments that make me yearn for a time machine; how fun it must have been to watch everyone in their boiled sheets struggling to dance like clumsy ghosts, while next door, others dressed in their Sunday best glided gracefully around and around until at last the new year came. “Have you had a skate on?” is a popular salutation these days in Santa Rosa. The skating rinks which opened Saturday evening at Ridgeway hall and Red Men’s hall are doing a land office business every night and in the afternoons many take the opportunity to become acquainted with the fascinating pastime. Attorney Willaim Finley Cowan is nursing some strained ligaments of the arm and wearing one of these member is splints as he result of an attempt to use roller skates at a local rink Friday morning. He was formerly one of the best skaters in Santa Rosa… [when] he was something like twenty-three years younger and over a hundred pounds lighter…Those in the vicinity declare that an earthquake had occurred when “Billy” hit the floor, but their fears were soon dispelled. The rink is a splendid building, 74×200 feet, and is being constructed of rustic, [sic] with a pressed steel front in imitation of bricks. There will be room for some four hundred skaters on the floor, and seats will be provided for one thousand spectators, while the hall will be large enough for convention purposes and will hold fully 3500 people on such occasions. Already there is some talk of having the coming lecture of William Jennings Bryan in this building next fall. Adjoining the rink Mr. Bowers is having his large public bath house erected. The excavation for the swimming tank is being rushed to completion at the present, and when completed will be 40×100 feet, while the building itself will be 60×120 feet. The baths will be fitted up in the latest manner, being equipped with slide trapese, rings, and the like and will be connected with the skating rink so that there will be an opportunity to pass from one to the other. The marble grinds off all the rough and uneven places on the wood and gives the surface a smooth and pleasing finish. After the marble has been used, then there is a large pad, arranged nearly four feet square, which is faced behind the machine, and in a short time there is absolutely no dust to be found on the floor. Another advantage in the method is the doing away of all chalk and other applications. This makes it especially pleasing for the ladies, as there is no danger of soiling the white clothes while skating. Mr. Bowers’ plans is certainly a very unique one, and by test has been found to do its work to perfection. The attraction at the Pavilion Skating Rink this evening will be the presence of Joe Waldstein, the world’s champion skater…Waldstein will be present Tuesday, Wednesday, and Thursday evenings, and for these three evenings the management has decided to charge an admission of 25 cents. 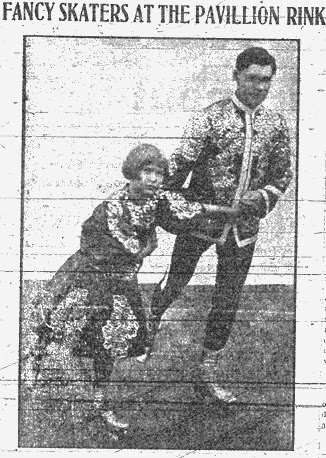 On each of the evenings mentioned there will be a grand skating march led by Mrs. Bender and Mr. Waldstein and much interest is being taken in the event. On Thursday night the rink will be run by the polo team, at which time there will be a polo game and possibly a ladies’ tournament. The entire management will be turned over to the polo boys, and Captain Burris will act as floor manager. The time for closing will be extended a half hour longer than the usual time for closing, and one and a half hours will be devoted to ladies and escorts only. The boys are desirous of making a good showing on that occasion, and have planned to make the evening a very interesting one for the spectators. Considerable interest is centering in the Sheet and Pillowcase Masquerade which is announced to take place at Bower’s hall next Monday night. The idea is something novel and there will be a large attendance. The reason the plan is proving so popular is that it is no easy to secure the costume for the event. All that is necessary to make it complete is to have a sheet wrapped around the body up to the arm-pits, and a pillowcase over the head, having cut two holes for the eyes. Butler’s orchestra will furnish the music for the event, and the admission will be twenty-five cents for spectators and fifty cents for maskers.